I posted a couple pictures of this soup on the Facebook page late Sunday night, I was rushing to finish up prepping it for my lunches for the week and get to bed. We had a bit of a bad ending to our weekend when our seventeen year old daughter came home from work that evening and said that someone broke into her car. Nothing of value was taken, but it still had her a little shaken up. So it was definitely very dark by the time I was able to get the soup on the stove and a couple snapshots on my phone were all I got for pics. Good thing this is a favorite soup of mine, so I'll be able to update later, but for now, these will do. We're heading into the final week of the Live Healthy Iowa challenge and it's been a great ride. During this time I was able to complete one round of the Insanity program. It was definitely one I struggled with, it's by far the most challenging workout I've ever done and while I didn't lose a ton of weight like some do. I'm so proud to say I finished and I feel so much stronger overall! This past week I've begun a new program called T25, it's a cardio based workout that is only 25 minutes a day. It feels wonderful to be done in such a short amount of time, yet still leaves me dripping with sweat. I've also begun training for a Mother's Day four mile race, so I'm dedicating a few days each week to running. Now that it's officially spring, I can't wait to get back outside for my runs. So I've gone back to using what I call the portion fix container system. If you've ever heard of the 21 Day Fix, then you probably know what I'm talking about. They are small color coded containers I use in planning out my meals. I know a get a certain number of each color for the day so I can just measure my foods in there to coordinate my meals, etc. I haven't always been a believer in them, but I seen some great results when I first started really working out so I knew it was time to get back to it. I feel like it's a great way for me to ensure that I'm eating enough veggies in a day and not too many carbs, which are always a downfall for me. 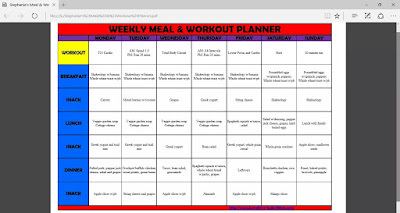 My husband helped me create this detailed spreadsheet so I can plan out my weekly meals and workouts. I loved having it for the week and always knew what I was planning to eat next. I did realize that I'm not eating enough early on in my day and that's leaving me really hungry by the time I get home from work and I don't feel like having an after dinner snack usually so I'm going to eliminate that I think. A lot of you let me know you like my sharing this, so I'm aiming to keep on top of it and make sure I share it each week, either in a blog post or on Facebook, maybe even both. Wow, so I've gone a little off topic from the soup. I love Panera, if I ever do eat out for lunch I almost always choose there. They've got fresh salads that I really like and good soups. My favorite by far is the garden vegetable with pesto. I knew it would be much more cost effective if I would just recreate my own version at home so I've been doing this since last fall I believe. Now, Panera adds barley to theirs but I chose to keep that out and just used veggies. It's still very flavorful and I think the yellow wax beans always look like pasta anyways. Even after eating this for four days straight this week, I still could go for another bowl. I just love it that much! I've still got one more gift to give to one of my readers as we are wrapping up Live Healthy Iowa. Scheels is a favorite store in our family, especially with the hubby; and I've got a $25 gift card to send to one of you compliments of the Iowa Food and Family Project! We're keeping it super simple to enter this time again, here's what I want you to do: Leave me a comment with your go-to lunch for work, etc. Feel free to add a link too. I'll draw one winner on Monday, April 3rd. Good luck and I can't wait to read all of your responses. In a large stock pot, heat olive oil over stove. Add in onion and bell pepper and let cook for a few minutes to soften. Then add in minced garlic and let cook for one minute, just until fragrant. 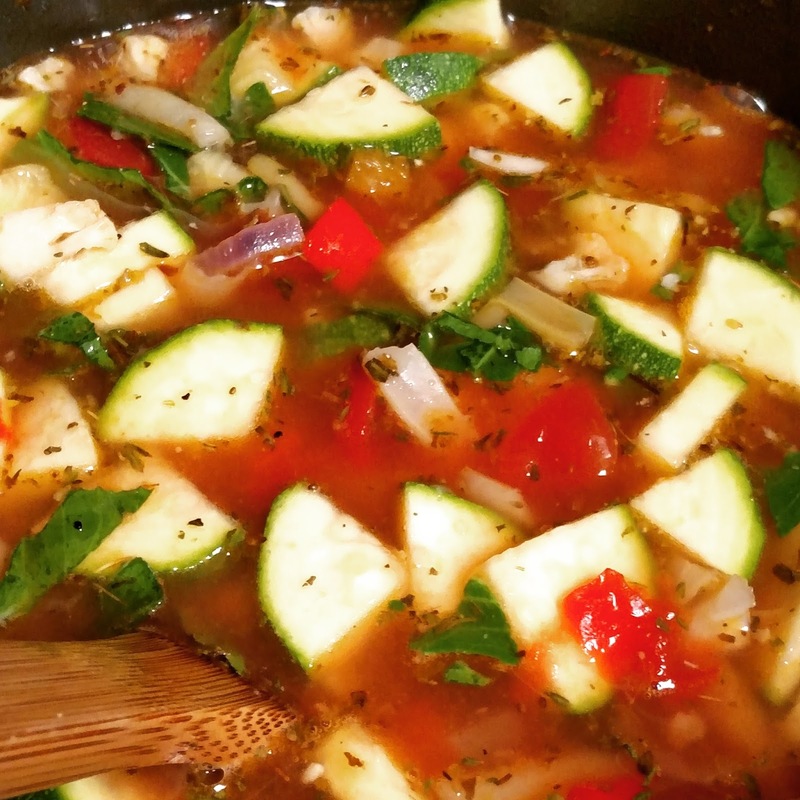 Dump in beans, cauliflower, tomatoes and zucchini. Continue to let cook for a couple minutes before adding in vegetable broth and one cup of water. Season well with herbs, salt and pepper. Add in greens and let come to a boil before turning down to simmer. Let soup simmer for 20 minutes. Remove from stove and ladle into bowl. Serve with a spoonful of pesto on top. Makes about 4-5 servings. 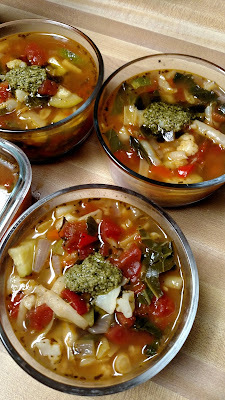 If you're using soup to meal prep: Ladle soup into desired storage bowl. I used two cup glass pyrex containers with lids. I was able to get just over four bowls for the upcoming week. I did add the pesto on top, but be forewarned, it did tend to stick more to the lid when I went to reheat. If you don't want that to happen, I would recommend adding pesto to another small container. I was able to scrape most of it off and mix into my soup so it's really your preference. 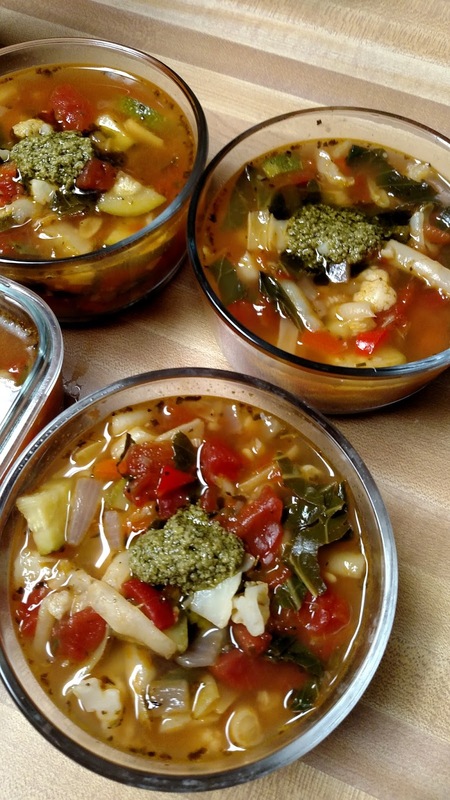 This soup also does freeze very well! Buffalo shredded chicken wrap. Delicious! I like to bring salads or any leftovers we have in fridge. Hey i just read your post. I found it really useful since i was looking for an easy but different recipe of making soup. Thanks for the share!